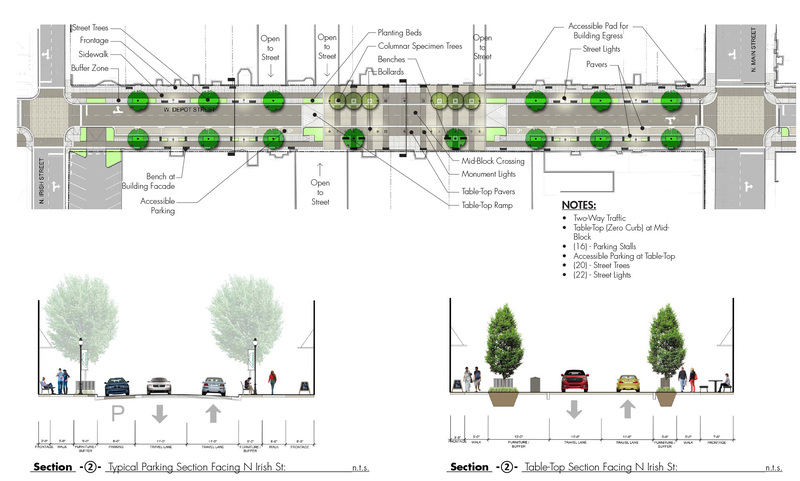 Earlier this week, Associate Principal Cliff Brooks and the project engineers Vaughn and Melton, presented the preliminary streetscape design for three blocks of Depot Street in Greeneville, TN. Getting feedback from the community is always an extremely important step in our design process. We want to ensure that the design accurately represents the community and addresses the community’s hopes and concerns. It is one of our favorite parts of the design process, getting to work with the people our design will impact. The concept is that by creating a more walkable, pedestrian-friendly, and attractive downtown this will attract development and spark economic growth. We have seen this result first hand with many of our streetscape projects, including most recently Downtown Concord, NH. Once his presentation was complete, Cliff began taking questions from the community. Below are some of the questions we often hear when presenting streetscape improvements to a community and they revolve around parking, cost and maintenance, and utility upgrades. To ensure that there isn’t an undue burden of cost and maintenance on a community we evaluate and recommend materials such as plantings, site furnishings, and paving that are durable and easy for the town to maintain. In regards to trees, Cliff said a recommendation will be made for a tree that would be drought tolerant and require little care. He added that there are technologies that direct tree root growth downward and prevent roots from getting under the street or sidewalk to cause damage. The question of utility upgrades is usually raised as it seems logical that if you are constructing a new streetscape to improve the town’s infrastructure as well. Vaughn and Melton will be working with the local utilities to plan for upgrades to water, sewer, electrical as well as other services as the streetscape improvements are made.